Matcha green tea powder is considered as the most potent drink available. 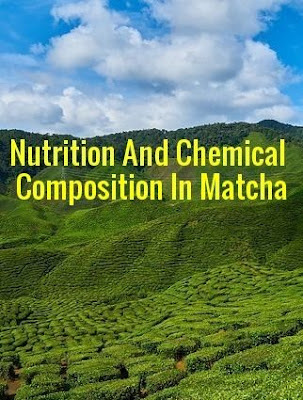 Get to know the Green tea composition, consumption, and chemistry in the following pages. The world production of tea is around 2.5 million metric tons, and out of this only 20% constitute green tea by preventing the oxidation of useful polyphenols and micronutrients.The polyphenols present in one cup of tea is around 20-45% and contains more than 200 bio-active compounds. Tea leaves like other plant leaves contain mostly water, when the leaves are plucked from the plant they lose water and begin to wither. As tea leaves lose water or wither, their cell walls get damaged and the chemical compounds inside cells come in contact with atmospheric air and initiate a group of reactions called oxidation. From the years of experience, the tea cultivators have developed processes to prevent natural withering/oxidation and produce teas that have a desirable appearance, aroma, flavor, and taste.The main compounds that give that desirable quality are polyphenols, amino acids, enzymes, pigments, carbohydrates, methylxanthines, vitamins, minerals and many volatile flavors and aromatic compounds. The entire tea processes developed today involves the reaction between the above compounds to give tea the desired benefits. Organic matcha has many vitamins, minerals and trace elements useful to our body. The main ingredient in matcha tea is Epigallocatechin (EGCG), L-Theanine and flavonoids. While EGCG and flavonoids work in our body to neutralize the effects of free radicals, L-Theanine a very vital amino acid that helps improve brain functions in our body. The benefits derived from these antioxidants found in matcha in its natural state without any side effects enhances the need to include this magic potion in our regular food intake program in order to maintain a healthy body and mind. These are compounds produced as a defense mechanism to prevent insects and other animals from attacking the plants and are available in abundant amounts in tea ss high as 30-40%.This polyphenol is a derivative of amino acids which is converted using sunlight as a catalyst and hence, shade cultivated tea contains a smaller concentration of polyphenols and a higher concentration of amino acids.The concentration of polyphenols is the highest in the buds and first, tender leaves and the levels drop down as you go down the plant.The important Tea Flavanols, which are within the flavonoid groups belonging to the polyphenol category are catechin (C), epicatechin (EC), epicatechin gallate (ECG), gallocatechin (GC), epigallocatechin (EGC), and epigallocatechin gallate (EGCG). Of which epigallocatechin gallate (EGCG)is the most active antioxidant compound in tea. Tea leaves contain various useful amino acids and amongst which the amino acid L-Theanine is found in abundant quantity.Out of the only three natural shrubs where L-Theanine is found Camellia sinensis is one among them.The percentage of amino acids is increased by cultivating the tea leaves in shade.In normal sunlight, the amino acids in tea leaves are converted into polyphenols, this conversion is prevented by growing tea in shade.Therefore the percentage of amino acids is retained in the tea leaves without conversion.L-Theanine promotes calmness and tea caffeine in combination with Theanine induces a state of mental alertness. Tea leaves contain two important enzymes oxidase and peroxidase.The function of these enzymes is to change the color of the tea leaves brown when the internal cell walls are damaged and exposing the polyphenols to atmospheric oxygen called as oxidation.This action of browning can be arrested by heating the tea leaves and is the first process in tea manufacture. Pigments in the tea leaves give color to the leaves.Therefore, the leaves are green due to the pigment chlorophyll.There is another pigment called carotenoids which are made of carotenes that give an orange color and xanthophylls that give a yellow color.During oxidation, tea leaves wither and change dark in color due to the condensation of the pigments. Tea plant like all other plants store energy formed during photosynthesis.These are carbohydrates.The stored energy are used to help the enzymatic reactions during oxidation and creation of polyphenols in young tea leaves.The presence of carbohydrates gives sweetness to the tea. Methylxanthines in tea are made up of three compounds the stimulant caffeine, theobromine, and theophylline. Methylxanthines contribute to a bitter taste in the tea infusion. These are figures considering a one mug full(8 oz) Matcha drink.